This month was John's birthday and this is the card that I created for him. 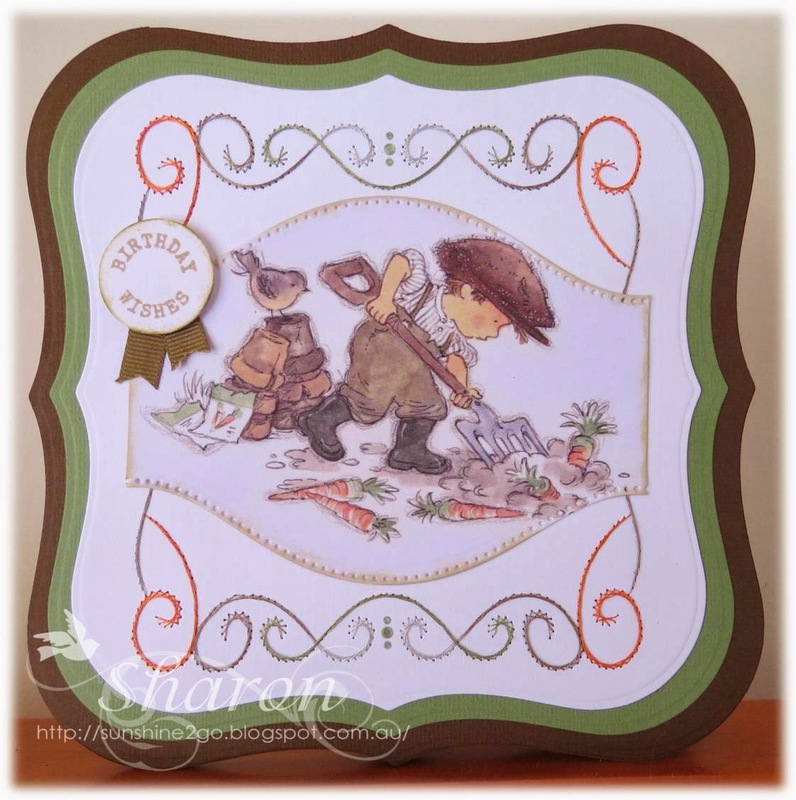 I found the perfect image from one of the Lili of the Valley paper pads "Vintage Boys", John loves his garden and has lot's of wonderful things growing. I used Spellbinder Boardabilities S5-201 to die cut the image and added some distress ink along the edges. The "Happy Birthday" stamp is also from Lili of the Valley. I enjoyed creating this card and I hope that you like it as well. Next month Ann's Paper Art forum is celebrating 5 fabulous years, to help celebrate I have created a card using pattern number a294 by Ann. The embossing folder is Cuttlebug "Swiss Dots"
The Joy ribbon 6002/0197 brings the stitching and embossing folder together. To colour I have used distress ink and chalks by Joy. 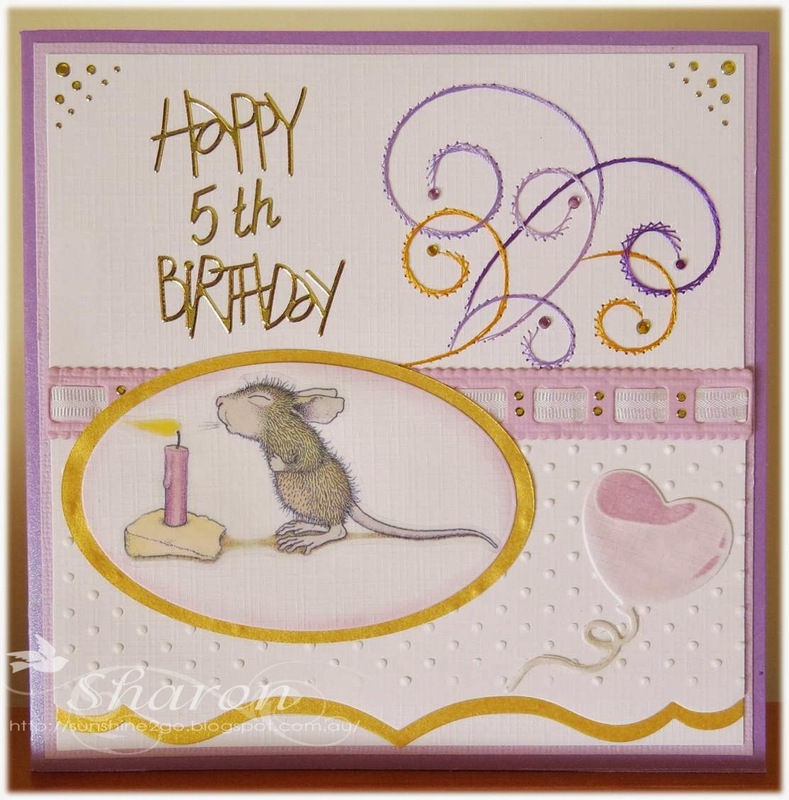 Elizabeth Craft Design "Happy Birthday"
Gems, hobbydots and ribbon have also been added. I loved creating this card and I hope that you like as well. We have started exchanging cards once again at Ann's Paper Art. by Ann's Paper Art - Ann005. Threads are Mettler Polysheen 0020, 0824, 1911. The mannequin die is by Marianne LR092 the pleated skirt was made with a die from Nellies Folding dies nfd 002. I die cut the little red shirt with the mannequin die and added some Hobbydots down the front. Gathered ribbon sits above the skirt. mannequin, which has distress ink around the edges. 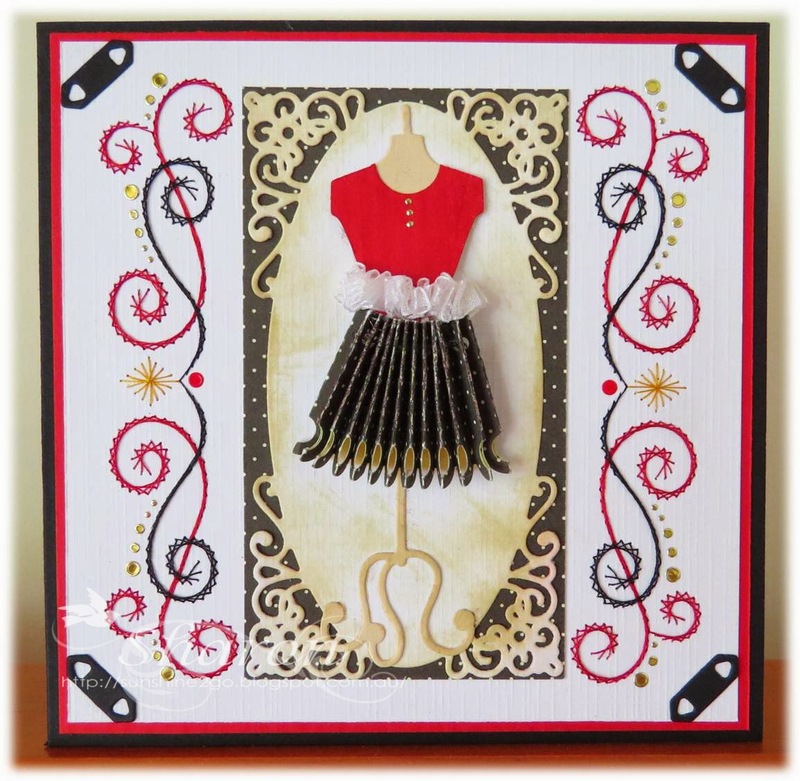 The background paper and skirt are from First Edition paper pad "Noir et Chic"
Hobbydots have been added amongst the stitching. This card was a lot of fun to create and I know that I will be having lot's more fun with the Mannequin die in the future. I received my order from Ann's Paper Art webshop and in it was this beautiful new die by Joy Crafts. Immediately I wanted to bring it to life combining it with one of Ann's fabulous patterns. The die is by Joy! Crafts called 'Billie" 6002/289. I love the edging and lattice on this die. I die cut the inserts in green and placed them back in the spaces, I die cut extra's and added them between the leaves. I gently added distress ink "forest moss" around the outer edge of the die. 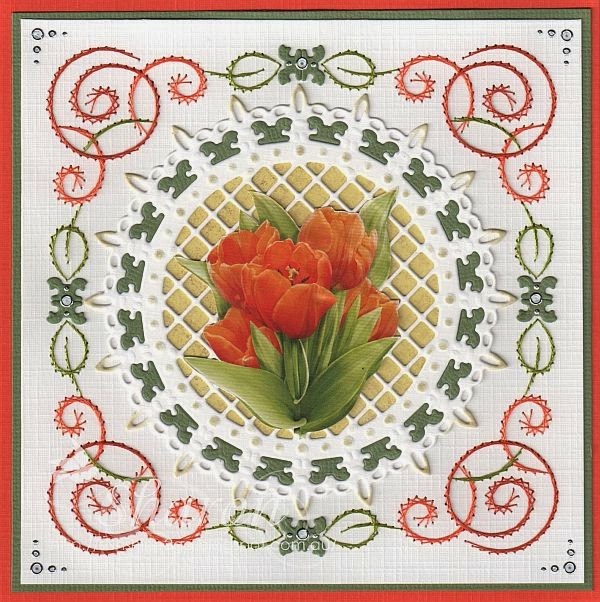 The tulips from Le Suh decoupage sheet 777-397 fitted perfectly in the centre. Behind the lattice I added some paper from my stash. Hobbydots have been used to decorate the card. For those of you in Winter I thought that this card would cheer you up with the feeling of Spring. This was such a fun card to create.